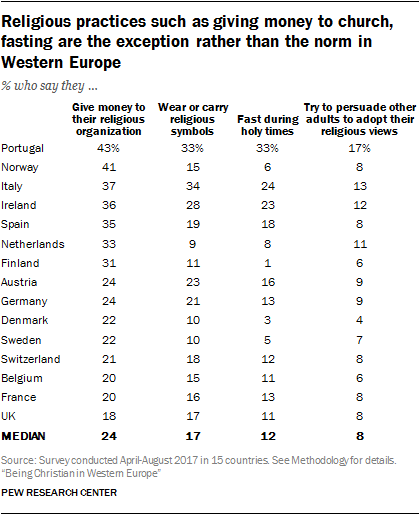 Relatively few adults in Western Europe participate in religious activities. For example, across the 15 countries surveyed, a median of 22% say they attend religious services at least once a month. By comparison, regular religious service attendance is much more common in some other parts of the world with large Christian populations, including Africa, Latin America and the United States, and it is somewhat more common in Central and Eastern Europe. The survey also asked about several other religious practices, including praying, sharing religious beliefs with others and donating money to religious organizations. These practices are also relatively rare across Western Europe. Despite these low levels of religious practice, most people in the region say they believe in God (58% median), although few say they believe in God with absolute certainty (15% median). Elsewhere around the world, considerably higher shares say they believe in God with absolute certainty, including in sub-Saharan Africa (median of 89%), the United States (63%) and Central and Eastern Europe (median of 40%). To provide a fuller picture of religious commitment across the region, researchers analyzed four standard measures of religious belief and practice together as an index: frequency of attendance at religious services, frequency of prayer, degree of importance of religion in the respondent’s life and belief in God. On this index, Portugal is the most religiously observant country in Western Europe, with more than a third of Portuguese adults (37%) showing high levels of religious commitment. Some other predominantly Catholic countries, including Italy (27%), Ireland (24%) and Spain (21%), also have relatively large shares of highly observant people. At the other end of the spectrum, just 8% of adults in predominantly Protestant Denmark are highly religious, and three-quarters of Swedes show low levels of religious commitment. Overall, women and people ages 55 and older are more likely than men and younger adults to display high levels of religious commitment. Roughly half or more people in most of the countries surveyed say they seldom or never attend religious services (median of 58%), while relatively few attend services at least monthly (22% median). Even in Italy, which has the highest share of people who attend at least monthly (43%) in the region, a substantial share seldom or never attend services (39%). People in Western European countries are far less likely than people in several other parts of the world to attend religious services regularly. In sub-Saharan Africa, for example, a regional median of 83% attend services monthly or more, and in Latin America, the corresponding figure is 64%. In the United States, 50% of adults say they attend services monthly or more. And in Central and Eastern Europe, a median of 32% attend religious services at least monthly. In most countries surveyed, majorities or pluralities say religion is either “not too” or “not at all” important in their lives (median of 54%). Large majorities say this in Denmark (72%) and Sweden (72%), as do roughly six-in-ten or more adults in Belgium (64%), Finland (62%) and the UK (60%). Fewer people say religion is either “very” or “somewhat” important in their lives (median of 46%), including a median of just 11% of adults who say religion is very important to them. Still, in three countries – Ireland, Italy and Portugal — respondents are significantly more likely to say religion is very or somewhat important in their personal lives than to say it is not too or not at all important. The share of adults who say religion is at least somewhat important to them is especially high in Portugal (72%). A median of just one-in-ten people (11%) across the 15 Western European countries surveyed say they pray daily, while nearly four times as many – a median of 40% – say they never pray. In several countries, at least half of adults say they never pray, including majorities in Sweden and Denmark (62% each). Rates of daily prayer in the region are very low compared with several other regions surveyed by Pew Research Center – including Central and Eastern Europe, where a median of 27% across 18 countries pray daily. In the U.S., a slim majority of adults (55%) say they pray daily, and rates of daily prayer are even higher in Latin America (median of 67%) and sub-Saharan Africa (median of 77%). Large majorities of Christians across the region are believers (median of 79%), but belief in God is far from universal among Western European Christians. For example, roughly three-in-ten or more Christians in Sweden, Belgium, Denmark and Finland say they do not believe in God. The survey also asked those who said they believe in God how certain they are about their belief. Relatively few people across Western European countries are “absolutely” certain of God’s existence: A median of 15% across the region express this view, compared with twice as many (median of 30%) who say they are only “fairly” certain. By comparison, a median of 36% of Western Europeans say they do not believe in God at all. Only in Portugal does a plurality of the overall population (44%) express belief in God with absolute certainty. In Germany, just 10% of adults say they believe in God and are absolutely certain, while nearly four times as many (37%) say they are fairly certain that God exists and a similar share (36%) do not believe in God. Four standard measures of religious observance – worship attendance, prayer, belief in God and importance of religion in one’s life – were combined into an overall index of religious commitment. Using this index, researchers categorized respondents into three groups: high, moderate and low levels of religious commitment. To be counted as showing a high level of religious commitment, a respondent had to report at least two of four highly observant behaviors or beliefs – attending religious services at least monthly, praying at least daily, believing in God with absolute certainty or saying that religion is very important to them.15 Those in the low commitment group, on the other hand, said at least two of the following: They seldom or never attend religious services, seldom or never pray, do not believe in God, or consider religion “not too” or “not at all” important in their life. People with other combinations of responses – for example, those who say they attend religious services once or twice a year, pray once or twice a month, believe in God and are fairly certain, and consider religion somewhat important to them, or those who show mixed levels of observance across the measures (such as praying daily and attending religious services monthly but saying religion is not important in their lives and that they don’t believe in God) –were categorized as having a moderate level of religious commitment. Overall, relatively few people across the region score high on the index (median of 13%), while most Western Europeans score low (median of 58%). The remainder (median of 29%) fall somewhere in the middle. People ages 55 and older are significantly more likely than both 18- to 34-year-olds and 35- to 54-year-olds to show high levels of religious commitment. And in Western Europe, as in many other parts of the world where Christians predominate, women generally are more religious than men. For example, 22% of women in Norway score high on the index, compared with 12% of men. While the countries with the largest shares of highly religious people in the region have Catholic majorities (Portugal, Italy, Ireland and Spain), Catholics and Protestants overall show similar levels of religious commitment. A median of 14% among both Catholics and Protestants across the countries surveyed (with large enough sample sizes for either group) score high on the index. In every country surveyed, Christians are more likely than religiously unaffiliated people to exhibit a high degree of religious observance; still, relatively few Christians score high on the index of religious commitment (median of 16%). For example, in Austria, 39% of Christians display low levels of religious commitment, while a plurality (46%) are moderately religious, and far fewer (15%) show high levels of observance. In no country surveyed are a majority of Christians highly religious on the index, although substantial shares of Christians show high levels of engagement in Portugal (43%), the Netherlands (35%), Italy (31%) and Spain (31%). The survey also asked about several other traditional religious practices, including wearing religious clothing or symbols, fasting during holy times and sharing one’s religious beliefs with others. Few people across the region engage in these practices (regional medians of 17%, 12% and 8%, respectively). Voluntarily giving money to one’s church, mosque, synagogue or temple is somewhat more common: A median of 24% in the region say they donate to a house of worship. Still, in no country does even half of the population donate money to a religious organization. In general, Christians are more likely than religiously unaffiliated adults to engage in these practices, but even among Christians, these practices are far from the norm. For example, only in two countries, Norway and the Netherlands, do majorities of Christians voluntarily give money to their churches (61% and 58%, respectively). And in Italy, the historic heartland of Catholicism, fewer than half of Christians (40%) typically wear or carry religious symbols or garments with them. Across the region, more women than men donate money to a religious institution and wear religious clothing or symbols. And those without a college education are more likely to wear religious symbols than are college graduates. Overall, young adults (ages 18 to 34) are less likely than older people to say they give money to religious organizations. But when it comes to fasting, wearing religious symbols or persuading others to adopt their religious beliefs, there is no clear pattern of differences between these age groups. Across the region overall, Catholics are more engaged with some of these practices than are Protestants. For example, Catholics are more likely than Protestants to wear religious symbols (medians of 27% among Catholics and 15% among Protestants across the region) and fast during holy times (15% and 6%, respectively). But Protestants are somewhat more likely than Catholics to give money to their churches (34% median, compared with 27% among Catholics).